Every night as soon as the last skier carves turns down the mountain and the lifts have stopped carrying passengers up the hill, the faithful snow groomers make their way up the slopes, preparing, smoothing, and molding the mountain for the next day. While a seemingly simple task, the art of snow grooming is actually a very specialized chore suited to extremely specific types of equipment. In fact, there seems to be as many different types of snow groomers as there are snow sports. The groomers built for alpine ski slopes are used for various tasks. When a ski area has experienced a lot of snowfall, the groomers need to pack the snow and improve the conditions. They flatten the terrain and ensure that skiers have access to smooth, easy turning slopes, rather than having to navigate moguls or other obstacles. When the ski area hasn't had snow for awhile, the groomers move artificial snow to places on the mountain where the terrain may have become patchy or icy. Because a ski and snowboard park has so many different jumps, rails, gaps, and tabletops there is very specialized grooming equipment needed to ensure that each of these elements remains in consistent shape. There are also specific groomers for creating half-pipes. Snowmobile trails tend to be narrow so the snow groomers are smaller and leave behind a packed trail that the snowmobiles can follow. 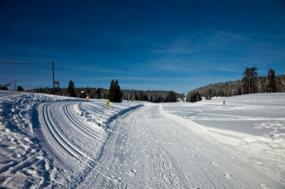 Cross country ski trails often have two different types of tracks, a wide flat area for skate skiing and a two-lane track for classic skiing. The snow groomers use specialized drags that smooth the center and cut a two-ski or four-ski track into the right or left side of the path. Different companies make dozens of styles of grooming machines. At their most basic, the groomers built for ski slopes usually employ hydraulically operated blades, powerful rotary tillers, and shaping equipment. Although there has been a consistent need for grooming machines, several manufacturers have gone out of business in the past decade and have left behind two major companies that monopolize the majority of the snow grooming business. The Prinoth BR 350 has uniquely designed cutting teeth and a hydraulically controlled flex motion that can groom at much higher speeds. Optional hydraulic wings added to the tiller increase the width of the grooming area by three feet. According to the company, this wider pass ability "covers track marks on tight turns, reduces snow spillage while grooming downhill...and improves the curb on trail edges." One of the most well known names in the business, Sno-Cat's models are based on a four-track design. 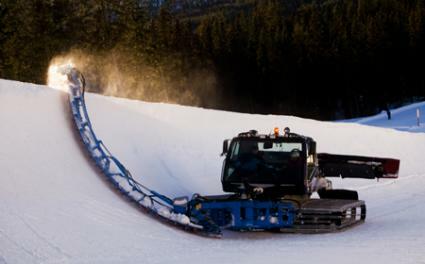 The distinctive idea behind Sno-Cat is the rubber track system, which, unlike steel tracks, allows the groomers to operate on all types of terrain without damaging the tracks. Unlike other machines, these can run on dry pavement, dirt roads, mud and deep powder snow. Manipulating and packing snow has inevitable negative environmental effects. Some studies in New Zealand have shown a significant removal of native vegetation and a noticeable change in the topography of the land where snow grooming takes place. Snow grooming also makes the snow more compact, which creates lower soil temperatures and can affect everything from the natural pH of the soil to a depletion of essential nutrients for plants to grow. Very little research has been conducted on the environmental effects of snow grooming, but some conservationists are concerned that this practice needs to be observed more closely so that the ecology of ski area can remain viable for years to come.